Welcome to Part 2 of the article I wrote in May called Did You Earn Certs & Expect a $20,000 Raise? I was supposed to write this post a week later, but the way my life is set up, we’re in November…. As I was reflecting over this year, I felt compelled to write about using accomplishments, communication, and accountability to secure the bag. Women continue to struggle with self-promotion due to lack of confidence or fear of being perceived as bragging. But if your accomplishments are invisible to a boss who is busy juggling a thousand balls, you will not be rewarded at the frequency of the person who is advocating for themselves. Additionally, I thought about the points of contention this year and realized that most of the issues could have been addressed with better communication. Whether it was projects that did not progress as planned or wrong assumptions about someone’s intent, lack of communication was always the root cause. Moreover, I’ve observed that some people struggle with accountability. Well I have the opposite problem: I’m slightly OCD about holding myself accountable for the goals I set. As a result, I am always looking for ways to improve the process of setting goals and achieving meaningful results. (I also beat myself up when I do not meet the expectations I set for myself). 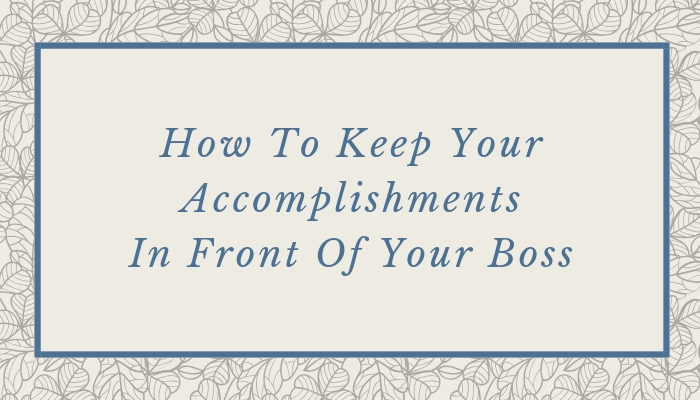 In the midst of all the tasking, how do you keep your accomplishments in front of your boss? How can you improve communication with your manager? How do you hold yourself accountable for reaching the goals you set? An effective way that I’ve learned to accomplish all three is a weekly report of accomplishments, activities, issues, and projects. Forces you to achieve goals so that you have accomplishments to report. Challenges you to be intentional about identifying and prioritizing high value work. Provides a running list of tangible contributions to justify pay increases and promotions. Changes the narrative from just “doing the job” to acknowledging your accomplishments. Allows you to regularly communicate your value, which boosts confidence and decreases imposter syndrome. Anything that could impact system availability. Technical limitations that could impact project deadlines. Resource constraints negatively affecting performance. Vendor disputes, product vulnerabilities, and capability issues. If you are not tracking your projects, even the mini projects, you need to start today. This provides clear visibility into your current workload. You can validate if your projects are aligned with the business. If you’re in a lead role (like I am), it provides insight into resource allocation for your team. You can determine whether your career goals are being met or growth assignments are needed. When priorities need to shift, your boss (not you) can determine what needs to move down or off the list. Ask these questions AT LEAST once a month. The only section that I’ll advise you not to compromise on is the accomplishments section. Leave it first and do not remove it! You should be having regular meetings with your manager. If you are not, raise your hand and ask for them! You can use these reports to guide your conversations and proactively manage your career growth. ← Keynote Speaker at Diana Initiative!